In today’s day and age, everyone is constantly on the go and no one has the time to while away even five minutes. Since time is equivalent to money people prefer to spend as little time as possible on any task. We get annoyed when the internet is slow; we get annoyed when a page takes too long to load or even when our friends come late when a lunch or dinner plan is made. However here is a list of some incredibly productive things you can do in five minutes. We all browse the internet for hours on end every single day owing to the fact that it has become so easy to access the internet from anywhere and at any time. Instead of simply robotically scanning your Facebook homepage, you could watch an enriching Youtube video about playing a simple tune on the guitar or piano. Learning a tune or two every week on any musical instrument could really help you become an excellent self taught musician. Contrary to what many people think, cooking is an extremely relaxing exercise, especially if it is something which you are interested in. In a matter of five short minutes you can whip up something absolutely delicious like a batch of biscuits, cookies, cheese omelets, French toast or for all those trying their hand at cooking for the first time they could start off with a simple pack of instant noodles. Cooking delicious treats for your family is really a feeling which is worth a million bucks! Whereas other sections of the newspaper might require more than five minutes, reading the comic section will surely take five minutes or even less. There is no better way to start your day with a little smile that comes to your face on learning about ‘Denis the Menace’ new tricks or the shenanigans of the ‘Family Circus’. Before work, no one really has much time to spare so you could read this section of the paper even in the bus, on your way to work. It’s no new fact that everyone in today’s age wants to get ahead in their careers and climb the ladder of success. However one thing is for sure, success is important however it means nothing when you have no one to share your moments of glory with. It won’t take you more than five short minutes to call up your friend and say a simple hello. Even something as small as this could really silently communicate to the friend you call that you care for them. Stitching on a button or sewing on a hook is a task that most often that not many of us put off. It is a small task that does not take more than five minutes, however we rather not wear the garment at all than to simply put in this five minute effort. However the simple thing to do is convince yourself that this is merely five minutes of your time, so instead of sitting in front of the idiot box for one whole hour, maybe you could try and watch tv for only fifty five minutes to facilitate your sewing work. In the course of the day, we come across an endless number of old people attempting to cross the busy street, especially during busy office hours. One highly productive thing you could do in simply a matter of five minutes is help an incapable senior citizen cross the road or even go a step further and reach them to their destination. Very often than not old people are abandoned by their children and a good deed like this could really brighten up their entire day and make them feel special. Instead of spending a lot of money hiring a gardener you can complete watering your plants or even your garden in a matter of five minutes. This acts a great way to de-stress yourself after a tiring day at the office. Ask anyone who is very interested in gardening and he or she will tell you that there is some unexplainable joy and calm which comes from being at one with nature. Once you give it a try it will become a hobby for you rather than a burden. What many people do not realize that when doing a job they spend more time searching and looking for stationary or papers as opposed to the time they actually spend on the job. If you were to take out even five short minutes from your busy schedule to neaten your work station then you would know that this could really help you in the long run. Neatening up your stationary section and allotting specific places for each thing would really help you increase your efficiency. You should make it a point to ensure that you check your mail at least once a day so as to ensure that you do not miss out on any important pieces of information. In addition to checking the mail that is delivered to your house through the post man, you should also quickly browse through you email inbox just to keep an eye out for anything important as well as delete any spam. Since you can easily check your mail on the go through your tab or phone you should, as it doesn’t take more than five minutes. Not everyone has the luxury to sit with the newspaper for an hour or two and read it from cover to cover however it merely takes five minutes to browse through the main headlines of any newspaper. In this day and age it is of paramount importance to ensure that you have at least some information about major world affairs otherwise you will find yourself to be too uninformed to have an opinion when these issues are being discussed by friends or at a business meet. Though you might not have the time to go to a proper class learn a new language like French, Spanish or German, one thing you can do is make it a point to learn a new word every day. This word can be in English, the vernacular or even any foreign language that you choose. Even a small step like this could really help you go a long way and you could even think about some innovative ways you could use these words in sentences to impress your friends and loved ones! One great way to de-stress yourself and gather your thoughts in a coherent and comprehensive manner is the simple practice of meditation. People who meditate are able to handle stressful situations with a great deal of grace and clarity unlike those who get overwhelmed and end up making a mess of things. It only takes as little as five minutes to meditate and spend some quiet moment with yourself but it will surely do you and your mind a world of good. It is no secret that exercising is extremely good. However most people consider subscribing to a gym is too expensive as well as time consuming. But what they do not know is that simple exercises can be done from the comfort of your own home without taking up much of your time at all. The simple exercises could be a little yoga, some pushups as well as some sit ups. These five minutes spent could really help you a great deal without you even realizing it. A task that most of us hardly ever take out time for is reading the scripture. We all have a copy of our religious text at home but opening it to do a little prayer and reading is not something we do. However taking out even five minutes from our busy schedule to do this will help us in so many uncountable ways, for instance we will be showered with God’s blessings, we will receive answers to our queries through the passages we read and over all we will learn to try and live righteous lives. 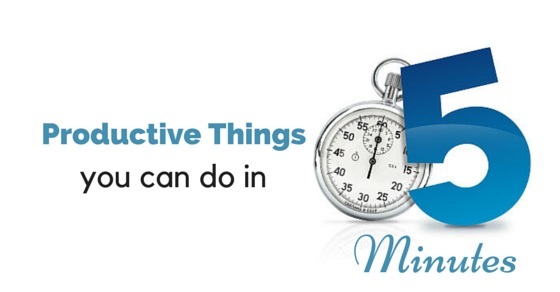 These are some incredibly productive things you can do in 5 minutes. Though these tasks are so easy to do hardly any of us ever do them. So do try it out on a temporary basis and over time you will end up making them a part of your daily schedule.